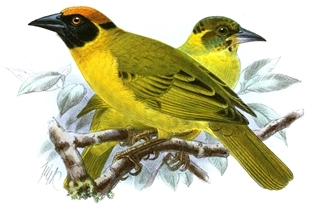 The Bertram's Weaver Ploceus bertrandi male is distinctive, with a chestnut crown, a black nape patch that is separated from the black face and throat by a narrow yellow line; it is golden yellow below with a saffron wash on the neck and breast. The female has an all-black head. Both sexes have yellow eyes, and unstreaked upperparts. The juvenile is similar to the female but the black on the head is mixed with green and yellow. 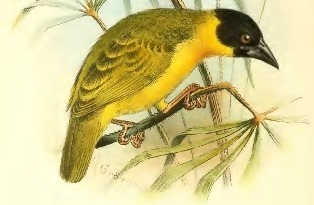 Sympatric forms of the Baglafecht Weaver P. baglafecht also have yellow eyes and a black mask, but the throat is yellow, and the upperparts are streaked. Bertram's Weaver was named after Bertram Lutley Sclater, a captain in the British army who served in Africa in the late 19th century, but the scientific name was given as bertrandi rather than as bertrami. The female was initially described as a separate species, and it took a few years before this was rectified. 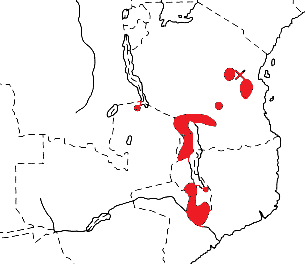 Bertram's Weaver occurs in estern Africa, from Tanzania, through Zambia and Malawi to Mozambique (see map below, based on Birds of Africa). No subspecies are recognised. Bertram's Weaver inhabits open woodland and bush along rivers, forest edges and cultivation in hilly country. It is found in trees and bracken-briar along stream lines in Zambia. Bertram's Weaver feeds on insects and nectar. It forages in pairs and in small groups of five or six individuals, by gleaning insects from vegetation. Bertram's Weaver is a monogamous, solitary nester. The nest is a ball woven of broad grass strips, without an entrance tunnel. The nest resembles the nest of Holub's Golden Weaver, but is rounder. The nest is lined with grass seed heads. It is typically placed near the tip of a lower branch of camelthorn acacias, or in the leafy end of an evergreen tree branch, and often near a stream. The eggs (clutch size 2) are deep green, heavily blotched and spotted with red-brown. The young fed by both sexes. Bertram's Weaver has no PHOWN records (see PHOWN summary). Very little is known about its breeding although it is fairly common. Submit any weaver nest records to PHOWN (PHOtos of Weaver Nests) via the Virtual Museum upload site.